OMAHA — Oregon State did it the hard way. And that only made its eventual triumph more rewarding. 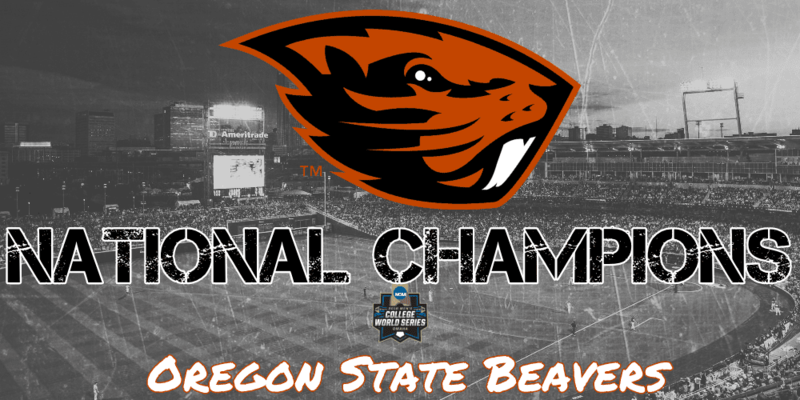 Last year, the Beavers were on the doorstep of history. By now, you know the story, but it bears repeating, because this team’s run to glory was forged in the fires of last year’s disappointment. A year ago, they were 56-4 — fifty-six and four! — and sitting pretty at 2-0 in College World Series bracket play. Three more wins, and they would become legends, members of the greatest college baseball team of all time. Then they lost back-to-back games to LSU, and the ride was over. 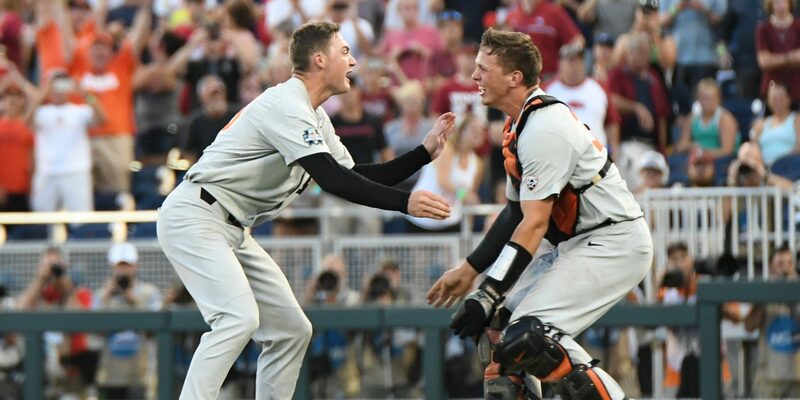 Experiencing the heartbreak of falling just short of immortality last year made it that much sweeter when the Beavers finally reached the pinnacle of the college baseball world on Thursday night, with an utterly dominant 5-0 win over Arkansas in Game Three of the CWS Finals. Nothing about this Omaha run came easy — until Thursday, when the Beavers finally played their “A” game for the first time in this CWS. They had to run through the losers’ bracket after playing very sloppy baseball in an 8-6 loss to North Carolina in their CWS opener. They were down three runs in the eighth inning of an elimination game against UNC a few days later, and they found a way to storm back and win. They were down to their final out in Game Two of the Finals on Wednesday night, and a misplayed pop-up by the Arkansas defense gave them a stay of execution. And did they ever make the most of their new life, tying the game moments later on a Grenier single, then going ahead on a Trevor Larnach homer. But Thursday, Oregon State asserted its will right out of gate, taking a 2-0 lead in the first inning and never looking back. The Beavers played a nearly flawless game; Arkansas had just one scoring chance in the entire game, loading the bases with one out in the third for the heart of the lineup, but OSU freshman righty Kevin Abel struck out 3-hole hitter Heston Kjerstad and got cleanup man Luke Bonfield to fly out, stranding the bases loaded. The Hogs never even managed another baserunner. Abel turned in a CWS performance for the ages, retiring the final 20 batters of the game after that third-inning jam to finish with a two-hit shutout. He threw 129 pitches, a day after throwing 23 pitches in a scoreless inning of relief. Thursday’s effort earned Abel his fourth win of the CWS, setting a new single-Series record. That final Abel outing was the stuff of legend, especially given how taxed Oregon State’s staff was by its run through the losers’ bracket. And he just kept getting outs, against an elite Arkansas offense that simply could not solve him. The Beavers had padded their lead to 5-0 by the time Abel struck out Luke Bonfield for the final out in the ninth inning, then screamed, turned and hurled his glove toward the OSU dugout along the third-base side. A moment later, catcher Adley Rutschman tackled him, and the dogpile that OSU had been deferring for the last two years finally materialized. “I haven’t taken a hit like that since eighth grade,” Abel joked of the Rutschman tackle. It was fitting that Rutschman and Abel combined to make that final out, because they turned in two of the greatest individual performances in CWS history. Rutschman went 3-for-4 with two RBIs Thursday to finish the CWS 17-for-30 (.567) with two homers, three doubles and 13 RBIs. He set a new record for most hits in a single CWS, while also setting single-season school records for hits (102) and RBIs (83). 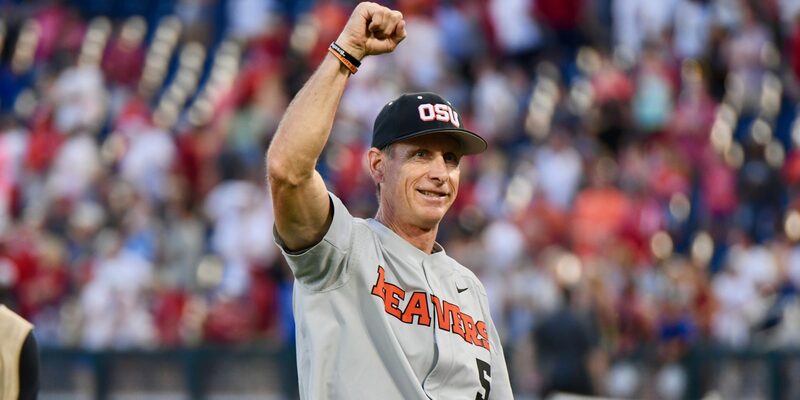 It was certainly one of the best seasons in OSU history, and it was capped by quite possibly the best individual performance in the long history of the College World Series. And that epic showing came one year after Rutschman went just 1-for-15 in last year’s CWS. But the struggle only makes the glory sweeter — you’d better believe that. Larnach — who hit .417 in the CWS with seven extra-base hits among his 15 hits (tied with Jason Lane for second-most all-time in a Series, only behind Rutschman) — said the emotion of finally reaching the top of the mountain was indescribable. And the way they got to the finish — well, it turns out immortality was in the cards for these Beavers after all.